Below you can find a number of Frequently Asked Questions related to Nevron products, pricing, licensing, and the purchase process in general. If you have any questions that are not covered in this list, we would be happy to answer them. Please contact the Nevron Sales Team. Q: What kinds of licenses do you provide and how does the licensing work? The components can be licensed as part of the Open Vision suite Professional and Enterprise editions. The licensing is based on a per developer (individual developer) using the Software for development purposes. Each developer who desires to use the Software must hold a valid Developer License. NOV Developer License is granted on a perpetual (permanent) and subscription (annual maintenance) basis. Developer License – required for developing with the NOV components. Desktop License – required for redistribution of compiled applications. The controls are royalty free for redistribution with compiled desktop applications. The Developer license is bound to specific machine ID. Developer Licenses will unlock the product, removing the evaluation watermark and will allow debugging. The Desktop license will not work when you run the app in debug mode on another development machine. To obtain the Developer License(s) for your product, you need to provide Nevron Customer Service with the appropriate Machine Id(s) for the machine(s) using Nevron Open Vision for .NET for development purposes. Your development Machine Id should also be displayed in the evaluation watermark and nag screen when running the examples shipped with Nevron Open Vision for .NET. The Desktop License is required for redistribution of your compiled application which uses Nevron Open Vision controls. You don't need to add the Desktop license in the Nevron License Key Manager - it has to be configured programmatically through code. Note: The Desktop license key will not work when you run your application(s) in debug mode on another development machine which doesn't have a valid Developer license. Q: Do you offer different editions of the products? The products can be licensed separately or as part of the Vision suite. The licensing is based on a per developer (individual developer) using the Software for development purposes and per production web server deployment (for web based applications). Each developer who desires to use the Software must hold a valid Developer License. The controls are royalty free for redistribution with compiled desktop (WinForm and WPF) applications. For web based applications - if you need to deploy your web application to multiple production web server, you need to obtain additional Server Licenses. There is no restrictions on the number of application per server, no restriction on the number of websites and no restrictions on the number of server CPUs. We do not charge for test servers. The Developer and Server licenses are bound to specific machine IDs. Developer Licenses will unlock the product, removing the evaluation watermark and will allow debugging. The Desktop license will not work when you run the app in debug mode on another development machine. To obtain the Developer License(s) for your product, you need to provide Nevron Customer Service with the appropriate Machine Id(s) for the machine(s) using Vision for .NET for development purposes. Your development Machine Id should also be displayed in the evaluation watermark when running the examples shipped with Nevron Vision for .NET. 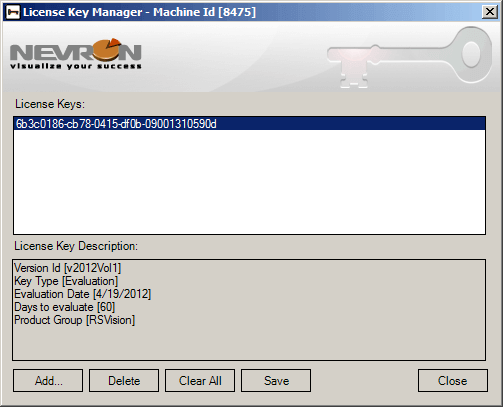 To obtain the Server License(s) for your product, you need to provide Nevron Customer Service with the appropriate Machine Id(s) for the Production Server machine(s) which will be displaying Nevron Vision for .NET web controls. You don't need to install Nevron on the web servers – you can redistribute the required Nevron DLLs with your application. 1. 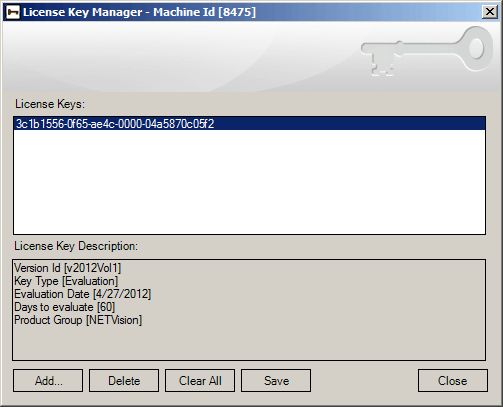 Copy/paste the Nevron License Key Manager application from your development machine on the server and run it. It will provide you with the server machine ID. 2. When you run the application on the server, the machine ID will be displayed in the evaluation watermark. Note: For the Desktop and Server licenses, it is recommended that you configure the licenses programmatically (not through the License Key Manager). That way, you will suppress any special permission for the ASP.NET account. The Desktop License is required for redistribution of your compiled desktop application which uses Nevron Vision for .NET controls. You don't need to add the Desktop license in the Nevron License Key Manager - it has to be configured programmatically through code. The licensing is based on a per production Web Front End (WFE) server. 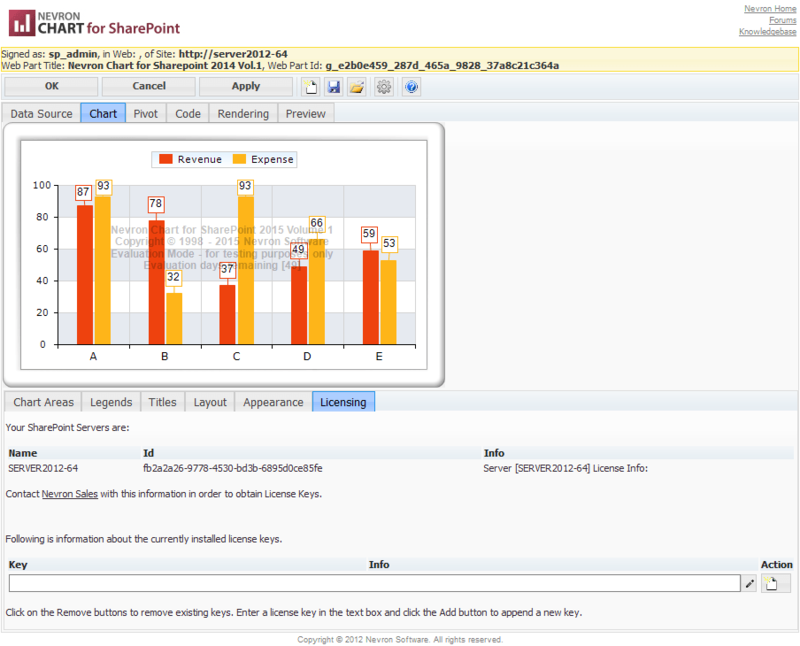 You need to obtain a valid Server License for each production WFE server in your SharePoint farm. There is no restriction on the number of web applications, the number of site collections, the number of developers/designers working with the web part designer and no restriction on the number of viewers. We do not charge for test and development servers. The Server licenses are bound to specific machine ID. Production Server Licenses will unlock the product, removing the evaluation watermark. To obtain the Server License(s) for your product, you need to provide Nevron Customer Service with the appropriate Machine Id(s) for the SharePoint Production Web Front End (WFE) Server machine(s) which is running and displaying the Nevron Vision for SharePoint web parts. In order to properly add the license key (to store in the farm), on the SharePoint configuration database in SQL Server (usually SharePoint_Config), you may need to provide EXECUTE permissions for the account running the Application Pool for the web application. If needed you can remove the EXECUTE permission afterwards. For the Config folder at: "C:\ProgramData\Microsoft\SharePoint\Config", provide Full control for the WSS_WPG group on all WFE servers. Check that the permissions are also applied to the cache.ini file under the config folder. Then save the license. Once the license is saved, you can roll-back the permissions for the Config folder. Once the key is added to the farm, you will be able to revert these configuration settings. A: No, the Vision for SharePoint web parts don't have different editions. The licensing is based on a per report designer/developer using the Software for report development and per production report server deployment. Each developer who desires to use the Software must hold a valid Designer License. Designer License – required for developing reports with the Nevron custom report items. Server License – required for production report server deployment. Each Designer License comes with one production Server License by default. If you need to deploy reports to multiple production report servers, you need to obtain additional Server Licenses. We do not charge for test servers. The Designer and Server licenses are bound to specific machine IDs. Designer Licenses will unlock the product, removing the evaluation watermark. Your development Machine Id should also be displayed in the evaluation watermark when running the examples shipped with Nevron Vision for SSRS. A: No, the Vision for SSRS products don't have different editions. Q: Can I place an order online via credit card? A: Yes, you can place an order online via credit card through our Online Store. This is the fastest and easiest way to purchase licenses for Nevron Software products. Q: How to obtain and activate your product license(s)? 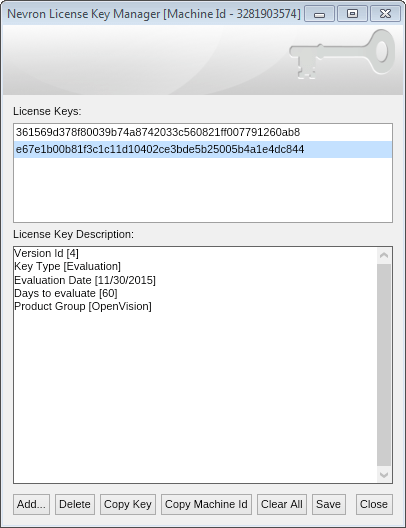 Q: How long does it take to receive my license key(s)? All Nevron products are delivered as ESD (Electronic Software Distribution) via e-mail and through your Nevron account. You will receive an e-mail from Nevron Customer Service with subject: "Thank you for purchasing Nevron products - activate your licenses". It will confirm that you have placed an order and that you have to provide the appropriate Machine Id(s) for your Development and/or Server machines in order to activate your Nevron product licenses. Q: What if there are problems with my purchase online order? A: If questions or problems arise with your online order, a Nevron representative will attempt to contact you via the email or phone number provided in your Nevron account. To ensure the process gets completed as soon as possible, make sure that the account information you provided is accurate. Q: Can I order via purchase order? A: Yes, Nevron accepts Purchase Orders from established companies, educational institutions, and government entities. For details, please visit the Ordering Information page. A: We accept the following credit cards for online purchases: Visa, MasterCard, American Express and Discovery. A: We accept payments only in US dollars. For alternative payment options and other currencies please contact Nevron Sales, we will provide you with a converted quote. A: We do not provide refunds once you have placed your order and the software has been delivered to you. We are proud with the quality of our pre-sales support and we provide our clients with fully-functional 60-day evaluation versions of the products. This way any potential customer can fully test the products and their functionality before placing an order. We make refunds only in case a credit card was stolen and used to purchase a Nevron product license. For more information, please visit the Policies page. Q: Do you offer your products through resellers or distributors? A: Yes, we do work with authorized resellers and distributors worldwide. If you would like to find a local distributor or if you would like to place an order through one of our resellers, please visit the Resellers page for more information. From your shopping cart you can increase the quantity (the number of licenses) per product. When increasing the quantity, the volume discounts will be applied automatically. Contact Nevron Sales for custom pricing quotes and OEM programs. Q: Do you provide discounts for educational, government or not-profit organizations? A: Yes, we offer a special educational, non-profit and government discount of 20%. Please contact Nevron sales and include your credentials (an email sent from a qualified institution is usually sufficient as legal proof). You will then be provided with a discount coupon you can use in your purchase. You can also submit a purchase order. Q: Do you offer competitive upgrade discounts? A: Yes, we realize that you may have invested a considerable amount of time and money in products from other vendors. If you currently are a client of one of our major competitors, you may qualify for the ROI (Return of Investment) program and receive competitive upgrade discount of 30% if you switch to Nevron products. Please contact Nevron Sales and include the invoice for the purchase of the competing product, as well as details about which product you would like to upgrade to. You will then be provided with a discount coupon you can use in your purchase. NOTE: Not all products from other vendors will qualify for the competitive ROI program. We provide the competitive upgrade discount only to clients of our major competitors. Q: Do you provide a demo / evaluation version of the products? A: Yes, we are providing fully functional 60-days evaluation (trial) versions for all Nevron products. You can download the evaluation installations from the Downloads page. The installations come with product help documentation and great number of reusable examples. The evaluation can be installed on any development, test or production machine. While working with the evaluation version, the only restriction is an evaluation watermark and/or a nag screen. The watermark will be removed when you add a valid Developer, Designer or Server License key.